2502. George KEINARD 1, 2, 3 (Margaret Elizabeth KENNEDY , Hannah BITLER , Jacob , Daniel , Johannes ) was born on 13 Mar 1880 in PA. He died on 2 Nov 1958. George worked as Wheelright in 1900. He resided in 1900 in Robeson Twp, Berks Co, PA. He resided in 1910 in Chester Co, PA. He resided in 1920 in Robeson Twp, Berks Co, PA. He resided in 1930 in Lincoln Highway, Caln Twp, Chester Co, PA. He worked as Carpenter - Contractor in 1930. The cause of his death was car accident. George married F May BUCHANAN about 1902. F May BUCHANAN was born about 1880 in PA. She died about 1927. F May BUCHANAN-5416 resided in 1910 in Chester Co, PA. She resided in 1920 in Robeson Twp, Berks Co, PA.
+ 6177 M i Lee B KEINARD was born about 1906. Bartram R ZEIDERS was born about 1908 in PA.
George also married Elsie S MANN about 1930. Elsie was born about 1895 in PA. She died in 1969. 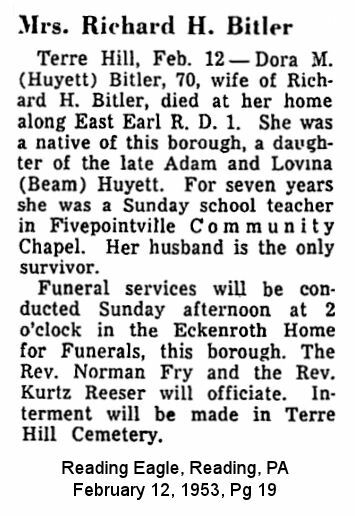 Elsie resided in 1930 in Lincoln Highway, Caln Twp, Chester Co, PA. She worked as None in 1930. 6179 M iii Charles KEINARD. 2503. Milton Peter KEINARD [scrapbook] 1, 2, 3, 4, 5, 6, 7 (Margaret Elizabeth KENNEDY , Hannah BITLER , Jacob , Daniel , Johannes ) was born on 26 Jul 1881 in Robeson Twp, Berks Co, PA. He died in Mar 1974 in Birdsboro, Berks Co, PA. He was buried in St Michael's Cemetery, Birdsboro, Berks Co, PA.
Milton resided in 1900 in Robeson Twp, Berks Co, PA. He worked as Farm laborer in 1900. He resided in 1920 in E 2nd St, Birdsboro, Berks Co, PA. He worked as Heater - Rolling Mill in 1920. He resided in 1930 in 512 East Second St, Birdsboro, PA. He worked as Laborer - Blast Furnace in 1930. He was issued a social security number before 1951 in PA.
Milton married Susie D MAUGER [scrapbook] 1, 2, 3, 4, daughter of A Everett MAUGER and Laura DERR, on 2 Jan 1907 in Birdsboro, Berks Co, PA. Susie was born in Dec 1888 in Birdsboro, Berks Co, PA. She died on 14 Jan 1957 in Birdsboro, Berks Co, PA. She was buried on 18 Jan 1957 in St Michael's Cemetery, Birdsboro, Berks Co, PA.
Susie resided in 1900 in Birdsboro, Berks Co, PA. She worked as At School in 1900. She resided in 1920 in E 2nd St, Birdsboro, Berks Co, PA. She resided in 1930 in 512 East Second St, Birdsboro, PA. She worked as None in 1930. She was a member of Alice Focht Memorial Methodist Church. She was a member of Women's Society of Christian Service. + 6180 F i Grace I KEINARD was born on 6 Dec 1909. She died in Nov 1988. + 6181 F ii Esther M KEINARD was born on 16 Apr 1912. She died on 7 Jul 1995. + 6182 F iii Laura C KEINARD was born on 11 Feb 1914. She died in Aug 1975. 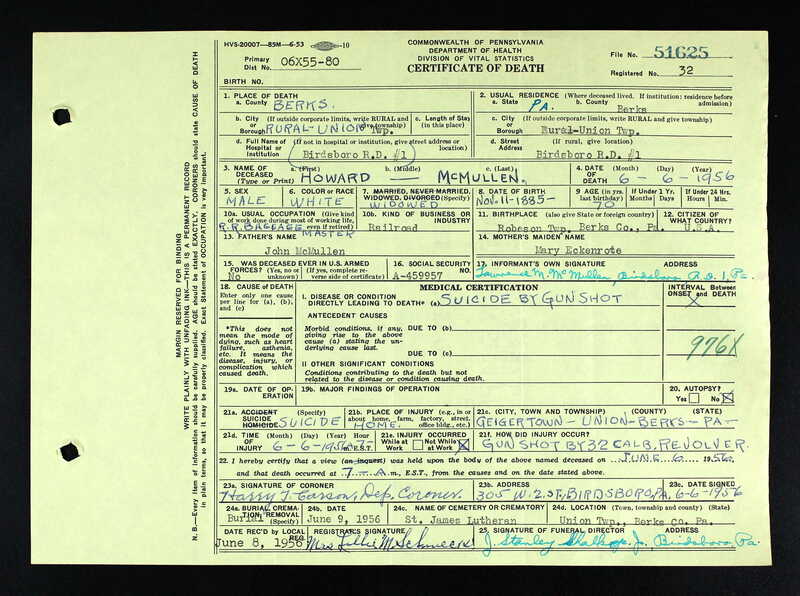 + 6183 M iv Milton Everett KEINARD was born on 12 Dec 1916. He died on 13 Sep 1995. + 6184 F v Miriam L KEINARD was born on 5 Aug 1919. She died on 16 Nov 2010. + 6185 F vi Dorothy Edith KEINARD was born on 21 Jan 1922. She died on 19 Feb 2008. + 6186 F vii Edna Margaret KEINARD. 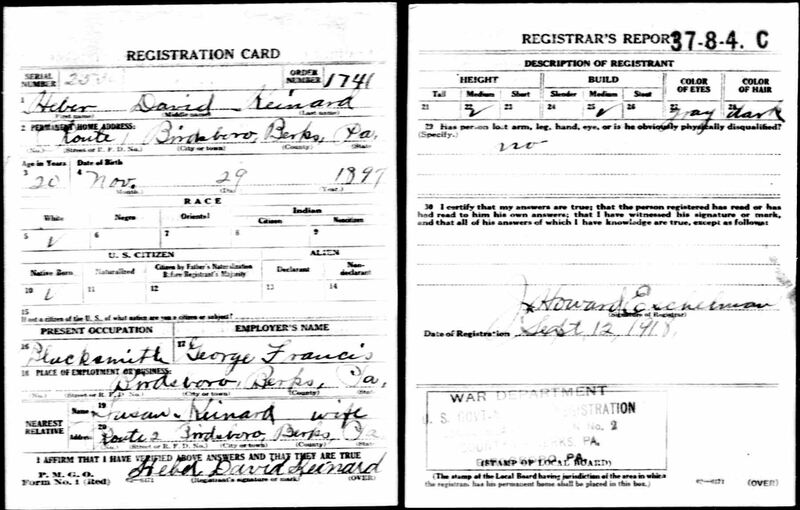 + 6187 M viii George Earnest KEINARD was born on 10 Mar 1928. He died on 21 Mar 2017. 2504. 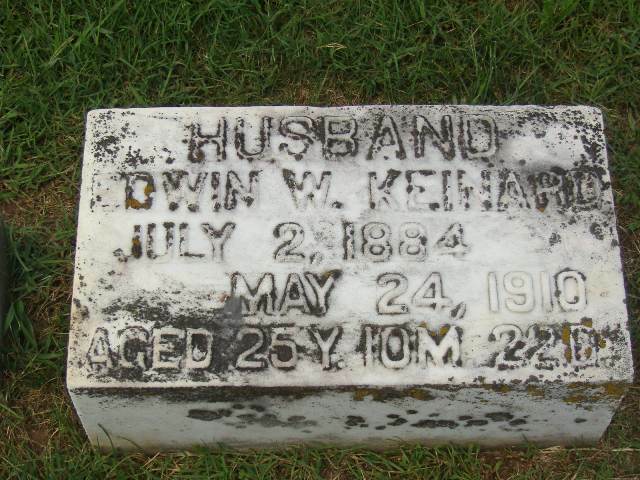 Edwin William "Eddie" KEINARD [scrapbook] (Margaret Elizabeth KENNEDY , Hannah BITLER , Jacob , Daniel , Johannes ) was born on 2 Jul 1884. He died on 29 May 1907. Eddie resided in 1900 in Robeson Twp, Berks Co, PA.
Eddie married Ada Victoria DEAM. Raymond Earl KEINARD [scrapbook] was born on 30 Dec 1906 in Birdsboro, Berks Co, PA. He died on 15 Jan 1907 in Birdsboro, Berks Co, PA. He was buried in St James Cemetery, Geigertown, Robeson Twp, Berks Co, PA.
2505. Bertha May KEINARD [scrapbook] 1, 2, 3, 4, 5, 6, 7, 8 (Margaret Elizabeth KENNEDY , Hannah BITLER , Jacob , Daniel , Johannes ) was born on 6 Jun 1886 in Robeson Twp, Berks Co, PA. She died on 9 Feb 1976 in Birdsboro, Berks Co, PA. She was buried on 12 Feb 1976 in St. James Cemetery, Geigertown, Union Twp, Berks Co, PA.
Bertha resided in 1900 in Robeson Twp, Berks Co, PA. She worked as At School in 1900. She resided in 1920 in Haycreek Road, Robeson Twp, PA. She was issued a social security number before 1951 in PA.
Bertha married Henry Clay BRADY Sr. [scrapbook] 1, 2, 3, 4, 5, 6, son of Ruben BRADY and Mary Elmira TRATE, on 29 Jun 1907 in Reading, Berks Co, PA. Henry was born on 27 Mar 1880 in Robeson Twp, Berks Co, PA. He died in Dec 1974 in Birdsboro, Berks Co, PA.
Henry resided in 1920 in Haycreek Road, Robeson Twp, PA. He was issued a social security number before 1951 in PA.
+ 6189 F i Margaret Elizabeth BRADY was born on 27 Jun 1908. She died on 17 May 1982. + 6190 M ii Brooke Raymond BRADY was born on 15 Feb 1911. He died in 1976. + 6191 M iii Henry Clay BRADY Jr was born on 14 Jan 1917. He died on 15 Jan 1996. + 6192 F iv Ruth May BRADY was born on 8 Jan 1923. She died on 15 Sep 1992. + 6193 F v Shirley Pauline BRADY was born on 5 May 1925. She died on 27 Oct 2010. 2506. Laura Minerva KEINARD [scrapbook] 1, 2 (Margaret Elizabeth KENNEDY , Hannah BITLER , Jacob , Daniel , Johannes ) was born on 26 Jul 1890 in Berks Co, PA. She died on 3 Aug 1948 in Union Twp, Berks Co, PA. She was buried on 8 Aug 1948 in St. James Lutheran Church Cemetery, Geigertown, Union Twp, Berks Co, PA.
Laura resided in 1900 in Robeson Twp, Berks Co, PA. She resided in 1910 in Wilmington, New Castle Co, DE. She resided in 1920 in Union Twp, Berks Co, PA.
Laura married Howard MCMULLEN [scrapbook] 1, 2, son of John MCMULLEN and Mary ECKENROTE/HECKRODE, about 1 Jan 1909 in Berks Co, PA. Howard was born on 11 Nov 1885 in Robeson Twp, Berks Co, PA. He was christened on 18 Apr 1886 in Trinity Lutheran Church & Circuit, Reading, Berks Co, PA. He died on 6 Jun 1956 in Union Twp, Berks Co, PA. He was buried on 9 Jun 1956 in St. James Lutheran Church Cemetery, Geigertown, Union Twp, Berks Co, PA.
Howard resided in 1910 in Wilmington, New Castle Co, DE. He worked as brakeman - railroad Co. in 1910. He resided in 1920 in Union Twp, Berks Co, PA. He worked as Brakeman - On Railroad in 1920. He worked as Railroad Bagage Master in 1956. The cause of his death was Suicide - 32 Calibur Revolver Gunshot. Mary Minerva MCMULLEN [scrapbook] was born on 4 Jan 1910 in Wilmington, New Castle Co, DE. She died on 4 Sep 1947 in Reading, Berks Co, PA. She was buried in St. James Lutheran Church Cemetery, Geigertown, Union Twp, Berks Co, PA.
Mary resided in 1910 in Wilmington, New Castle Co, DE. 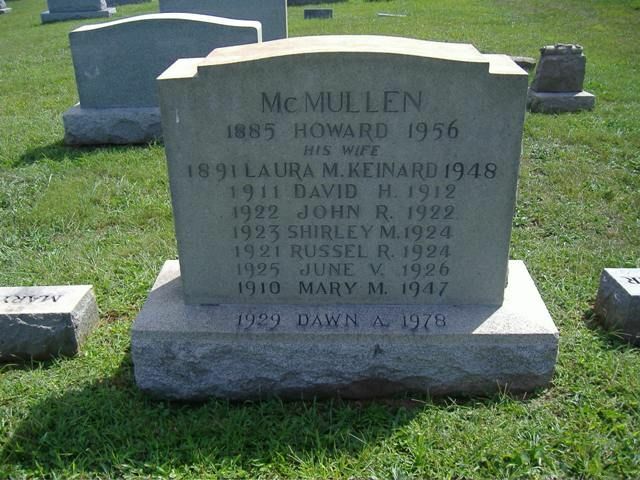 She resided in 1920 in Union Twp, Berks Co, PA.
David H MCMULLEN [scrapbook] was born on 20 Aug 1911 in New Castle Co, DE. He died on 11 Mar 1912 in DE. He was buried in St. James Lutheran Church Cemetery, Geigertown, Union Twp, Berks Co, PA.
David resided in 1911 in 1019 Elm St, Wilmington, New Castle Co, PA.
+ 6196 M iii Elwood LeVerne MCMULLEN was born on 24 Feb 1913. He died on 9 Mar 1991. + 6197 M iv Pierre Cyril MCMULLEN was born on 7 Feb 1915. He died in Apr 1987. + 6198 F v Edythe Lucia "Edith" MCMULLEN. + 6199 F vi Loretta Keinard MCMULLEN was born on 13 Mar 1919. She died on 10 Jan 2001. + 6200 M vii Lawrence Merrill MCMULLEN was born on 5 Mar 1927. He died on 27 Mar 2017. Russel R MCMULLEN [scrapbook] was born on 20 Feb 1920 in Geigertown, Berks Co, PA. He died on 10 Dec 1924 in Union Twp, Berks Co, PA. He was buried on 15 Dec 1924 in St. James Lutheran Church Cemetery, Geigertown, Union Twp, Berks Co, PA.
John Raymond MCMULLEN [scrapbook] was born on 30 Oct 1922 in Berks Co, PA. He died on 10 Dec 1922 in Union Twp, Berks Co, PA. He was buried on 13 Dec 1922 in St. James Lutheran Church Cemetery, Geigertown, Union Twp, Berks Co, PA.
Shirley Madeline MCMULLEN [scrapbook] was born on 25 Nov 1923 in Berks Co, PA. She died on 13 Feb 1924 in Union Twp, Berks Co, PA. She was buried on 17 Feb 1924 in St. James Lutheran Church Cemetery, Geigertown, Union Twp, Berks Co, PA.
June Valeria MCMULLEN [scrapbook] was born on 10 Mar 1925 in Geigertown, Berks Co, PA. She died on 12 Jan 1926 in Union Twp, Berks Co, PA. She was buried on 16 Jan 1926 in St. James Lutheran Church Cemetery, Geigertown, Union Twp, Berks Co, PA.
+ 6205 F xii Dawn A MCMULLEN was born in 1929. She died in 1978. 2507. 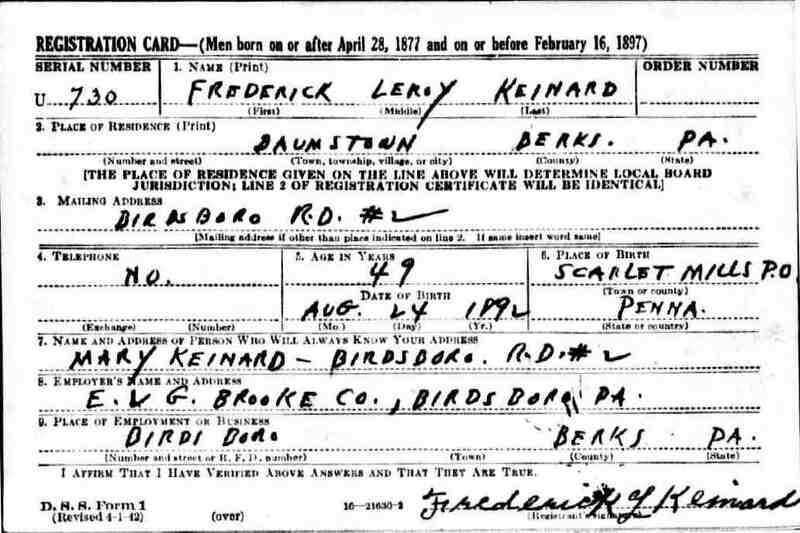 Frederick Leroy "Freddie" KEINARD [scrapbook] 1, 2, 3, 4, 5 (Margaret Elizabeth KENNEDY , Hannah BITLER , Jacob , Daniel , Johannes ) was born on 24 Aug 1892 in Geiger's Mills, Robeson Twp, Berks Co, PA. He died in Aug 1975 in Birdsboro, Berks Co, PA.
Freddie resided in 1900 in Robeson Twp, Berks Co, PA. He resided in Jun 1917 in Geiger's Mills, Robeson Twp, Berks Co, PA. He worked as Cart Driver with John T. Dyer Quarry in Jun 1917 in Trap Rock (Birdsboro), PA. He resided in 1920 in Exeter Twp, Berks Co, PA. He worked as Laborer - Iron Works in 1920. He resided in 1930 in Exeter Twp, Berks Co, PA. He resided in 1939 in Baumstown, Exeter Twp, Berks Co, PA. He resided in 1942 in Baumstown, Exeter Twp, Berks Co, PA. He worked with E & G Brooke Co. in 1942 in Birdsboro. 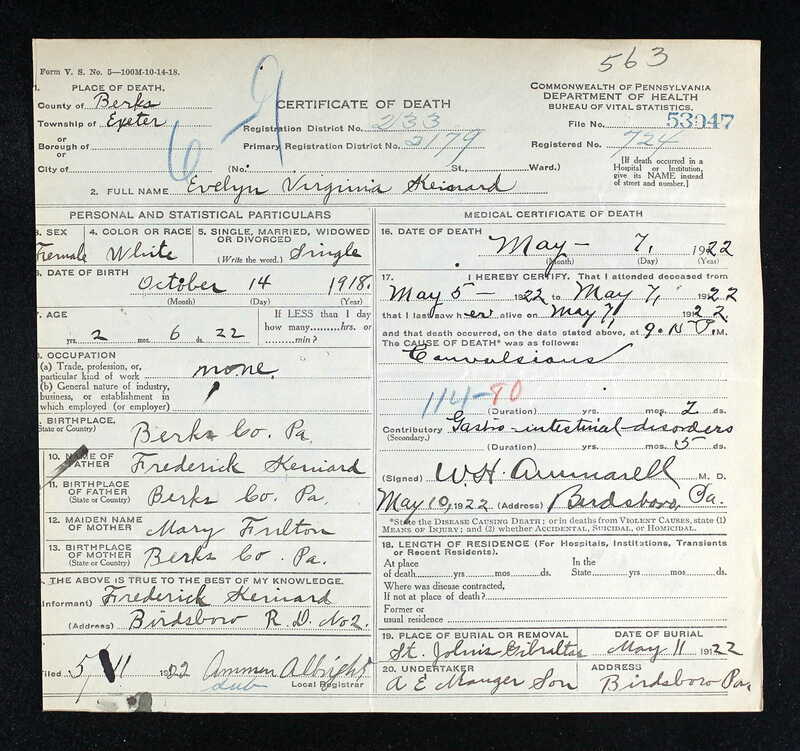 Freddie married Mary Bell FULTON 1, 2, daughter of Elmer S FULTON and Susan HAHN, about 25 May 1918 in Berks Co, PA. Mary was born in 1899 in Lorane, Exeter Twp, Berks Co, PA. She died in 1986 in Birdsboro, Berks Co, PA.
Mary resided in 1920 in Exeter Twp, Berks Co, PA. She resided in 1930 in Exeter Twp, Berks Co, PA.
Evelyn Virginia KEINARD [scrapbook] 1 was born on 14 Oct 1919 in Berks Co, PA. She died on 7 May 1922 in Exeter Twp, Berks Co, PA. She was buried on 11 May 1922 2 in St John's Union Cemetery, Gibraltar, Robeson Twp, Berks Co, PA.
Evelyn resided in 1920 in Exeter Twp, Berks Co, PA.
+ 6207 M ii Melvin Leroy KEINARD was born on 27 Aug 1921. He died on 17 Mar 2004. Effie L KEINARD [scrapbook] 1, 2 was born on 8 Oct 1923 in Baumstown, Exeter Twp, Berks Co, PA. She died on 4 May 1990 in Leader Nursing & Rehabilitation Center, West Reading, Berks Co, PA.
Effie resided in 1930 in Exeter Twp, Berks Co, PA. She was a member of First Church of the Nazarene in Birdsboro, Berks Co, PA. She resided until 26 Apr 1990 in 661 Dori Lane, Stowe, Montgomery Co, PA. She was issued a social security number in PA. She resided from 26 Apr 1990 to 4 May 1990 in Leader Nursing & Rehabilitation Center, West Reading, Berks Co, PA. She graduated from Birdboro High School. Effie married John P ONDO about 1957. 6209 M iv Lee David KEINARD. + 6210 F v Thelma Edith KEINARD was born on 14 Mar 1929. She died on 10 Mar 2018. Lloyd E KEINARD 1 was born on 4 Jan 1935. He died on 2 Jul 1948. He was buried in St John's Union Cemetery, Gibraltar, Robeson Twp, Berks Co, PA.
Freddie also married Mary MARTIN, daughter of SUSAN. Mary was born on 25 Feb 1899. She died in Feb 1986 in Pottstown, Montgomery Co, PA.
Mary was issued a social security number in 1973 in PA.
+ 6212 M vii Lee D KEINARD. 6213 M viii Lloyd KEINARD. 2508. Elmer Earl KEINARD 1, 2, 3, 4 (Margaret Elizabeth KENNEDY , Hannah BITLER , Jacob , Daniel , Johannes ) was born on 30 Jul 1894 in Robeson Twp, Berks Co, PA. He died in Oct 1983 in Douglassville, Berks Co, PA.
Elmer resided in 1900 in Robeson Twp, Berks Co, PA. He worked as Cart Driver in 1900. He served in the military with WW I. He worked as Farmer - Farm in 1930. Elmer married Ethel BRADY 1, daughter of Jacob Sylvester BRADY and Carrie May ZEIGENFUSS, on 8 Nov 1917 in Baumstown, Exeter Twp, Berks Co, PA. Ethel was born about 1897 in Springfield, NJ. + 6214 M i Horace KEINARD was born on 18 Feb 1918. He died on 18 Oct 1988. + 6215 F ii Margaret May "Peggy" KEINARD was born about Apr 1919. She died on 26 Dec 2011. + 6216 F iii Gladis Virginia KEINARD. 2509. Heber David "D Heber" KEINARD [scrapbook] 1, 2, 3 (Margaret Elizabeth KENNEDY , Hannah BITLER , Jacob , Daniel , Johannes ) was born on 29 Nov 1897 in Berks Co, PA. He died on 1 Jan 1992. He was buried in St. James Lutheran Church Cemetery, Geigertown, Union Twp, Berks Co, PA.
D Heber resided in 1900 in Robeson Twp, Berks Co, PA. He resided in 1920 in Exeter Twp, Berks Co, PA. He worked as Blacksmith - Blacksmith Shop in 1920. He resided in 1930 in 253 Hopewell St, Birdsboro, PA. He worked as Laborer - Railroad Shops in 1930. He was issued a social security number before 1951 in PA. He resided in 1966 in 253 Hopewell St, Birdsboro, PA.
D Heber married Susan R HOCK, daughter of Joel R HECH/HOCK and Catharine R REIDER, on 10 Aug 1918 in Birdsboro, Berks Co, PA. Susan was born on 2 May 1898 in Oley, Oley Twp, Berks Co, PA. She died on 21 Nov 1966. She was buried in St. James Lutheran Church Cemetery, Geigertown, Union Twp, Berks Co, PA.
Susan resided in 1920 in Exeter Twp, Berks Co, PA. She resided in 1930 in 253 Hopewell St, Birdsboro, PA. She worked as Housewife in 1930. She resided in 1966 in 253 Hopewell St, Birdsboro, PA.
+ 6217 F i Anna K KEINARD. 6218 F ii Fern Irene KEINARD. Fern married Frederick Earl SEIDT [scrapbook], son of Fred L SEIDT and Sally G HOUP. Frederick was born on 3 Dec 1922. 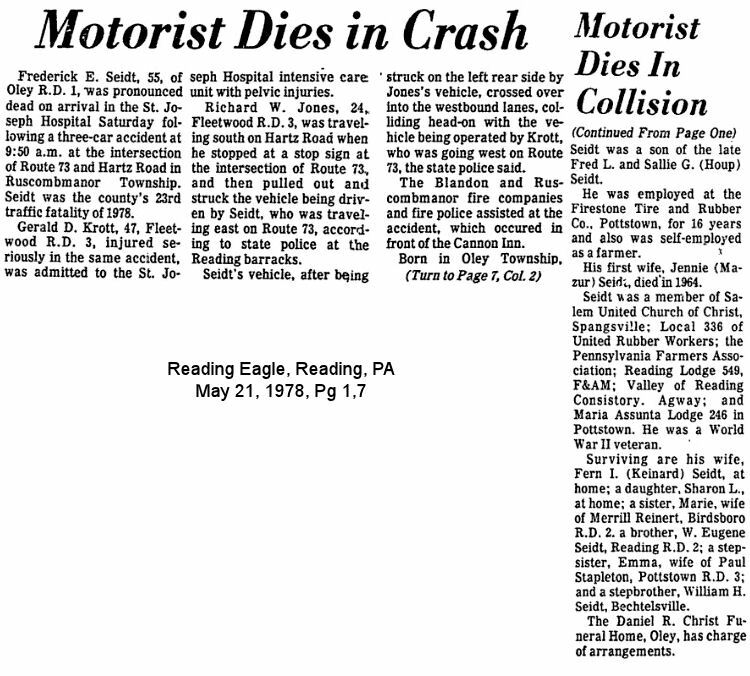 He died on 20 May 1978 in Oley Twp, Berks Co, PA. He was buried in Oley Cemetery, Spangsville, Oley Twp, Berks Co, PA.
Frederick served in the military with U.S. Army - Tech Serrgeant, 3535th Ord. Med. Auto. Main. Co. from 12 Jan 1943 to 13 Feb 1978 in WW II. He resides in 1972 in RD 1 Oley, Berks Co, PA. The cause of his death was Injuries sustained in an automobile accident. He worked as Farmer. He worked with Firestone Tire and Ruber Co in Pottstown, PA. He is a member of Salem United Church of Christ in Spangsville, Oley Twp, Berks Co, PA. He was a member of United Rubber Workers Local 336. He was a member of Pennsylvania Farmers Association. He was a member of Reading Lodge 549 F and A M. He was a member of Valley of Reading Consistory. He was a member of Maria Assunta Lodge 246 in Pottstown, PA. He served in the military with in WW II. + 6219 F iii June KEINARD. 2510. 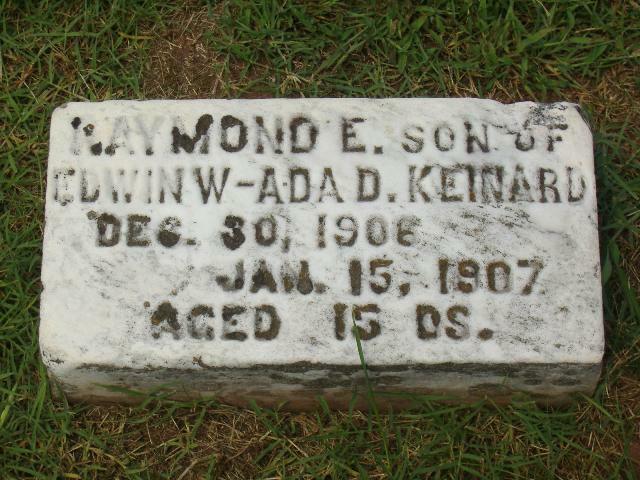 Howard Raymond KEINARD [scrapbook] 1, 2, 3, 4, 5 (Margaret Elizabeth KENNEDY , Hannah BITLER , Jacob , Daniel , Johannes ) was born on 15 Dec 1903 6 in Scarlet's Mills, Robeson Twp, Berks Co, PA. He died on 14 May 1993 6 in Birdsboro, Berks Co, PA. He was buried 6 in St John's Union Cemetery, Gibraltar, Robeson Twp, Berks Co, PA.
Howard was issued a social security number before 1951 in PA. He resided from Mar 1992 to May 1993 in Kutztown Manor, Kutztown, Berks Co, PA. He resided until Mar 1992 in Robeson Twp, Berks Co, PA. He worked as Farmer - 40 Yrs. He worked as Dohler Jarvis - Employee in Pottstown, PA. He was a member of St James Lutheran Church - Member in Geigertown, Berks Co, PA.
Howard married Bessie Elizabeth EBLING [scrapbook] 1, 2, daughter of Monroe EBLING and Rosie E GAUGER, on 9 Feb 1927 in St. Mark's Lutheran Church Parsonage, Birdsboro, Berks Co, PA. Bessie was born on 25 Oct 1906 3 in Mohnton, Berks Co, PA. She died on 29 Jan 1989 3 in Wyomissing Lodge Nursing Home, Reading, Berks Co, PA. She was buried 3 in St John's Union Cemetery, Gibraltar, Robeson Twp, Berks Co, PA.
Bessie was issued a social security number before 1951 in PA. She was a member of St. James Lutheran Church in Geigertown, PA. She was a member of Rebekah Lady Elizabeth Lodge 48 I.O.O.F. 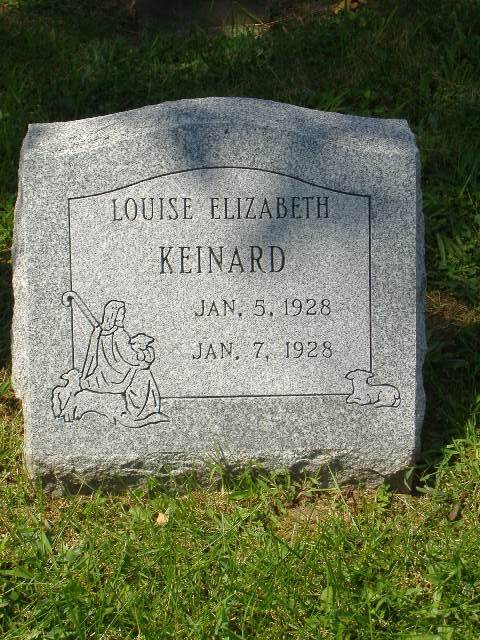 (2-term noble grand) in Morgantown, PA.
Louise Elizabeth KEINARD [scrapbook] was born on 5 Jan 1928. She died on 7 Jan 1928. 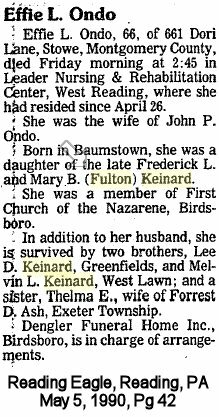 She was buried in St. James Lutheran Church Cemetery, Geigertown, Union Twp, Berks Co, PA.
+ 6221 F ii Carmen Dee KEINARD was born on 30 Sep 1929. She died on 17 Aug 2017. + 6222 M iii David E KEINARD Sr was born on 2 Aug 1934. He died on 22 Sep 2003. + 6223 F iv Marlene E KEINARD was born on 27 Jan 1939. She died on 13 Oct 2007. + 6224 M v Raymond Lee KEINARD was born on 5 Oct 1941. He died on 17 Feb 2017. 2512. Florence Victoria HEUYARD [scrapbook] 1, 2, 3, 4, 5, 6, 7, 8 (Emma E BITLER , John , Daniel , Daniel , Johannes ) was born 2 on 24 Aug 1894 in Terre Hill, Lancaster Co, PA. She died on 18 Aug 1982 in Lancaster General Hospital, Lancaster, Lancaster Co, PA. She was buried in Zeltenreich Cemetery, New Holland, Lancaster Co, PA.
Florence resided in 1900 in East Earl Twp, Lancaster Co, PA. She resided in 1910 in East Earl Twp, Lancaster Co, PA. She worked as Sewer - Shirt Factory in 1910. She resided in 1930 in Earl Twp, Lancaster Co, PA. She resided in 1940 in Earl Twp, Lancaster Co, PA.
Florence married Ivan Hobart STONE Sr [scrapbook] 1, 2, 3, 4, 5, 6, 7, 8, son of George Washington STONE and Mary Catherine DAUGE. Ivan was born 2 on 26 May 1896 in New Holland, Lancaster Co, PA. He died on 24 Jan 1984 in Lancaster General Hospital, Lancaster, Lancaster Co, PA. He was buried in Zeltenreich Cemetery, New Holland, Lancaster Co, PA.
Ivan worked 2 as Moulder - Foundry in 1920. He resided in 1930 in Earl Twp, Lancaster Co, PA. He worked as Moulder - Foundry in 1930. He resided in 1940 in Earl Twp, Lancaster Co, PA. He worked as foreman - foundry in 1940. + 6225 M i Ralph G STONE was born on 7 Mar 1915. He died on 5 Jan 2002. + 6226 F ii Marian Florence STONE was born on 5 Sep 1916. She died on 14 Jul 2018. + 6227 F iii Emma Kathryn "Kathryn" STONE was born on 16 Apr 1919. She died on 23 Apr 2014. 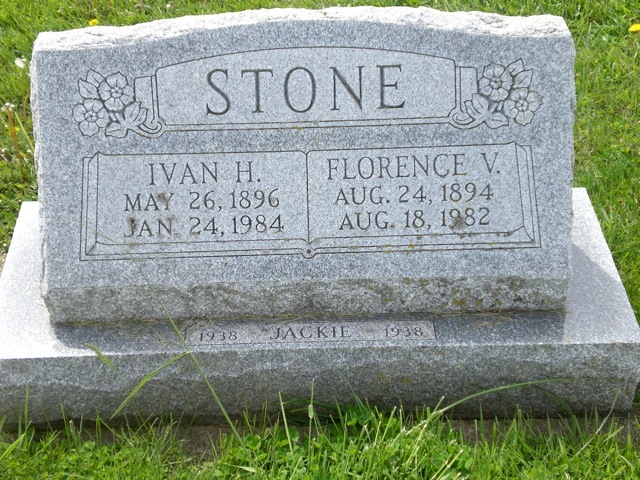 + 6228 F iv Evelyn V STONE was born on 18 Aug 1919. She died on 6 May 2004. + 6229 F v Mary E STONE was born on 10 Oct 1920. She died on 6 Jan 2015. + 6230 M vi Ivan H STONE Jr was born on 28 Dec 1921. He died on 30 Aug 2013. + 6231 F vii Mabel Irene STONE. + 6232 F viii Charlotte May STONE was born on 23 Nov 1926. She died on 25 Mar 2014. + 6233 F ix Janet A STONE was born on 5 Aug 1928. She died on 22 Feb 2012. + 6234 F x Hazel Alberta STONE. + 6235 F xi Constance Fay "Connie" STONE. 6236 M xii Kenneth Miles STONE. Kenneth married Andre Jean BYERLY. Jackie STONE [scrapbook] was born on 6 Nov 1938 in Earl Twp, Lancaster Co, PA. She died on 6 Nov 1938 in Earl Twp, Lancaster Co, PA. She was buried on 7 Nov 1938 in Zeltenreich Cemetery, New Holland, Lancaster Co, PA.
2514. 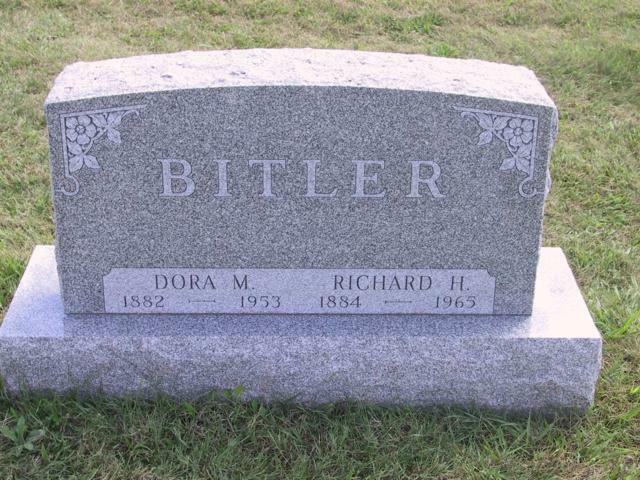 Richard Howard BITLER [scrapbook] 1 (William Henry , John , Daniel , Daniel , Johannes ) was born on 4 Sep 1884 in Lancaster Co, PA. He died in Jan 1965. He was buried in Terre Hill Cemetery, Terre Hill, Lancaster Co, PA.
Richard resided in 1910 in Lancaster Co, PA. He resided in 1930 in East Earl Twp, Lancaster Co, PA. He worked as Carpenter - House in 1930. He resided in 1940 in S On Rt 897, East Earl Twp, Lancaster Co, PA. He resided in 1942 in RD1, East Earl Twp, Lancaster Co, PA. He worked as Unemployed in 1942. He was issued a social security number before 1951 in PA.
Richard married Dora M HEUYARD [scrapbook] 1, 2, daughter of Adam HEUYARD and Levina C BEHM, about 1904. Dora was born on 25 Dec 1882 in Terre Hill, Lancaster Co, PA. She died 1 on 12 Feb 1953 in East Earl Twp, Lancaster Co, PA. She was buried 1 on 15 Feb 1953 in Terre Hill Cemetery, Terre Hill, Lancaster Co, PA.
Dora resided in 1910 in Lancaster Co, PA. She resided in 1930 in East Earl Twp, Lancaster Co, PA. She resided in 1940 in S On Rt 897, East Earl Twp, Lancaster Co, PA.
Dora BITLER was born about 1906 in PA.
Dora resided in 1930 in Terre Hill, Lancaster Co, PA.
Howard R BITLER [scrapbook] 1, 2 was born on 20 Feb 1908 in Lancaster Co, PA. He died 1 on 2 Apr 1926 in Lancaster Co, PA. 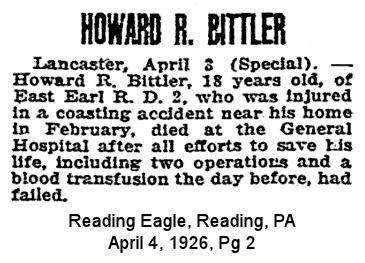 He was buried 1 on 6 Apr 1926 in Terre Hill Cemetery, Terre Hill, Lancaster Co, PA.
Howard resided in 1910 in Lancaster Co, PA. The cause of his death was hennorhage of liver from coasting accident. 2516. Mary R "Lillie ?" BITLER [scrapbook] 1, 2, 3, 4, 5 (Franklin Heberling , John , Daniel , Daniel , Johannes ) was born 2 in 1887 in Lower Heidelberg, Berks Co, PA. She died on 30 Apr 1960 in At Home, Shillington, Berks Co, PA. She was buried in May 1960 in Mohnsville Cemetery, Mohnton, Berks Co, PA.
Lillie ? resided 2 in 1907 in Mohnton, Berks Co, PA. She resided in 1910 in Shillington, Berks Co, PA. She resided in 1920 in Cumru Twp, Berks Co, PA. She resided in Oct 1923 in Shillington, Berks Co, PA. She resided in 1930 in 309 West Lancaster Ave, Shillington, PA. She worked as None in 1930. She resided in 1947 in 309 West Lancaster Ave, Shillington, PA. She worked as Housework in 1947. She resided in Sep 1954 in 309 West Lancaster Ave, Shillington, PA.
Lillie ? married 1 Harry W WERTZ [scrapbook] 1, 2, 3, 4, 5, son of John WERTZ and Rebecca WHITE, on 14 Dec 1907 in Mohnton, Berks Co, PA. Harry was born 1, 2 on 16 Nov 1884 in Shillington, Berks Co, PA. He died 2 on 7 Sep 1954 in At Home, Shillington, Berks Co, PA. He was buried 2 on 11 Sep 1954 in Mohnsville Cemetery, Mohnton, Berks Co, PA.
Harry resided 1 in 1907 in Shillington, Berks Co, PA. He worked 1 as Blacksmith in 1907. He resided in 1910 in Shillington, Berks Co, PA. He worked as Blacksmith (Own Shop) in 1910. He resided in 1920 in Cumru Twp, Berks Co, PA. He worked as Auto Machanic in 1920. He resided in 1930 in 309 West Lancaster Ave, Shillington, PA. He worked as Mechanic - Automobile in 1930. He resided in 1947 in 309 West Lancaster Ave, Shillington, PA. He worked as Auto Mechanic in 1947. He was a member of St. John's Lutheran Church in Mohnton. He was a member of Shillington Lodge No. 1175, IOOF. He was a member of Keystone Fire Co in Shillington. He was a member of Berks County Firemen's Association. 6240 F i Mary C WERTZ. Margaret A WERTZ [scrapbook] 1, 2, 3 was born on 6 May 1916 in Shillington, Berks Co, PA. She died on 24 Feb 1998 in At Home, Wyomissing, Berks Co, PA. She was buried on 2 Mar 1998 in Laureldale Cemetery, Tuckerton, Muhlenberg Twp, Berks Co, PA.
Margaret resided in 1920 in Cumru Twp, Berks Co, PA. She resided in 1930 in 309 West Lancaster Ave, Shillington, PA. She worked as None in 1930. She was issued a social security number before 1951 in PA. She resided in Sep 1954 in 309 West Lancaster Ave, Shillington, PA. She resided in 1992 in Wyomissing, Berks Co, PA.
Margaret married John W EMORE. + 6242 M iii Robert F WERTZ was born about Nov 1918. He died on 17 Jun 2001. + 6243 F iv Eleanor E WERTZ was born on 29 Mar 1923. She died on 8 Jan 1992. + 6244 M v Harry J WERTZ.